I’ve added the buttons to my friend Frank’s baby’s jacket. Today is the shower, so now I’ve got to run find a gift box and get it ready. Two of my co-workers will be having a baby in the next few days. 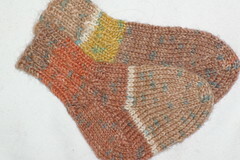 I quickly knit up some baby socks with Austermann’s Step Sock Wool. I used the ‘whisky’ (colour 09) colourway. This yarn has aloevera in it, so your hands are soothed while you work with it. Of course, the colour changes don’t happen frequently enough for socks this size, but I like the quirky unmatching, but still coordinating look of them. 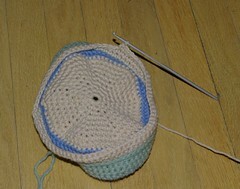 The ankle ribbing has a small cable detail every other two-stitch ridge. If you click on the photo you’ll see a close up. 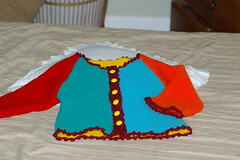 This is a detail of the little jacket I made for a friend’s soon to be born baby. It’s an 18 mo. 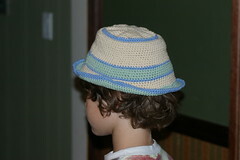 size so that it can be worn next spring and fall and even longer. Just at the midriff, I switched from garter to rizotto stitch. I had to go up a needle size and increase 8 sts. evenly across before I started the pattern because it pulled in, and if I did it again, I would increase 12 stitches evenly across the body. There’s still a little pit of pull, but it looks like a cinched waist, without the belt, so I left it in. For rizotto stitch (next time I’ll try this with a thin yarn on needles two sizes larger than the recommended size) you need an even number of stitches plus an extra stitch on each side for selvage. Rows 1, 3, 5: slip the first stitch (selvage) purlwise; knit across Row 2: Slip the first stitch, *p 2 tog, then without letting them fall from the left needle, k tog the same 2 sts (until one from end)*; k last stitch. Row 4: Slip the first stitch, p 1, *p 2 tog, then without letting them fall from the left needle, k tog the same 2 sts (until two from end)*; purl 1, k last stitch. Row 6: repeat from row 2. 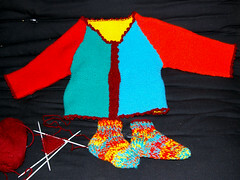 Originally uploaded by Jigra Knits. This is another project I’ve been working on recently. The sweater is primarily garter stitch, but there is a modified moss stich just below the armpits. I have yet to attach buttons onto it, but will soon. 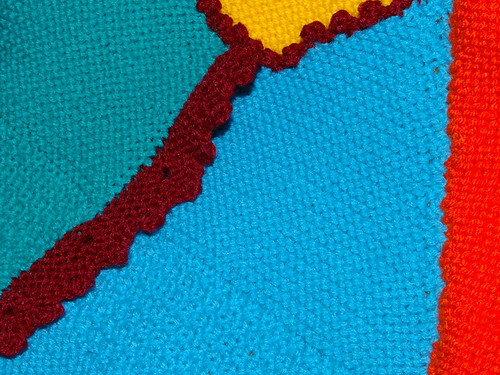 I made the pattern up and chose these bright colours. The back is entirely yellow. Of course I had more scraps than I knew what to do with so there are some slippers and a toque is on the needles; naturally I’m going to work some fairisle into it. I doubt all these items will be worn simultaneously (It’s a gift for a friend), but I don’t have any use for this colourway myself, so I thought I’d use up the scraps as quickly as possible. The color is light thyme and I don’t know what the final dimensions are going to be. 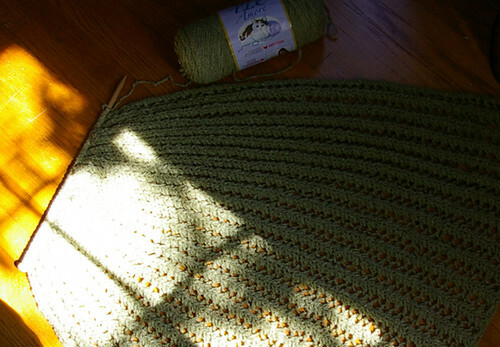 It’s light and fluffy, but warm all the same, because the yarn collapses into a snuggling blanket when relaxed and drapes out nicely when worn.